#AskAlan: Who would be the most and least-deserving player to win the U.S. Open? It's the most wonderful time of the year. The Masters is more glamorous, the Open Championship more freewheeling fun, but the U.S. Open is, quite simply, the greatest golf tournament in the world. Bring it on. From the looks of things, in about six days. Last week, when GOLF.com forced me to commit, DJ was gonna be my pre-tournament pick, but I outsmarted myself and went with Justin Rose. But Dustin had quietly been playing at an extremely high level all season, and the thrilling finish in Memphis brings into sharp relief how dangerous he'll be at Shinnecock. With caddies and players already on the ground there, the early word is the setup will favor long hitters, so DJ is headed to Shinny like King Kong lumbering toward Gotham. To mark or not to mark, that is the question. And clearly Jimmy Walker is fortune's fool, but to thine own self be true, and it must follow, as the night the day, thou canst not then be false to any man on Twitter. Okay, I'll stop now. Honestly, I'm having a hard time caring about who does and doesn't backstop, but the surrounding debate is fascinating. I think a lot of players are just lazy and don't want to have to hustle to mark their ball. Some are utterly oblivious. Others, as Walker suggested, are happy to help out a pal. This is not keeping with the Rule 22 but it is within the spirit of the game: we help playing partners look for lost balls, show them the bottom of the club so they know which iron we hit on a par-3, watch each other's lines on the greens. It's a game of small courtesies. On the list of golf's ills, backstopping doesn't make my top 10. Maybe top 20. But it sure gets people fired up. After I retweeted Walker's screed, my phone started dinging like a Vegas slot machine with texts and DMs from players, caddies and one salty Tour wife, the latter offering an unusual analogy that I won't use on this family-friendly website. 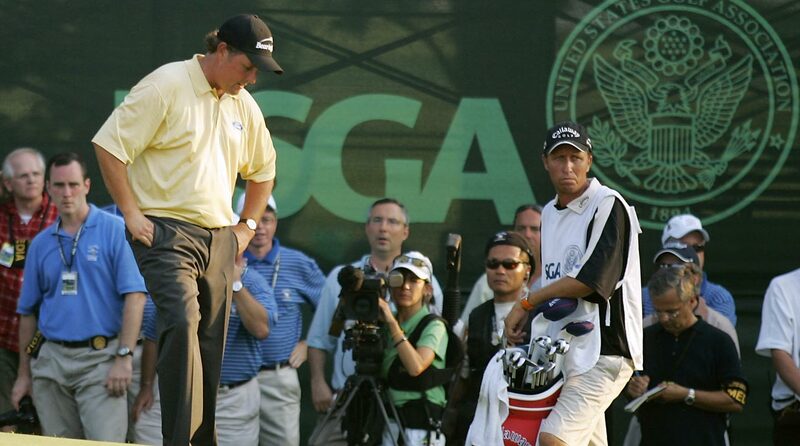 Phil is clearly the most deserving – dude has paid his dues and then some. Least deserving is tough. I'm gonna say Jon Rahm. He's clearly a world-class talent bound to win majors but winning this one would feel too fast; you're supposed to have your heart broken a few times before you break through. It's too easy to pick a random qualifier as most surprising so I'll go with Bubba. Even on courses where he has a great record he's as jumpy as a cat on a hot tin roof. The U.S. Open is golf's crucible, and Shinny the ultimate examination. Watson clearly has the game to win anywhere but if he can keep his composure and take this Open it would be a monumental achievement …and upset. Given its history, regal setting, rustic beauty and awesome challenge, it's a spectacular spot for the Open. But is it the greatest? See below. I'm not sure those ol' boys want one, and all the attendant hassle. But to make a more thorough assessment, I'm going to play there on Wednesday. Brace yourself for a week of FOMO-inducing tweeting as the golf cognescenti freeloads at all the great courses on Long Island. I would mention my other games at National, Garden City and St. Georges but that would be obnoxious and not at all my style. The driving stats are definitely worrisome: 182nd in driving accuracy, 123rd in strokes gained off the tee, although he had stretches of driving the ball beautifully, like during the weekend at the Players. But for Tiger the driver will always be a question mark, while it's a weapon for DJ, JT, Rory, Koepka, Rahm, Rose and many other top contenders. That puts a ton of pressure on the rest of Woods's game. Statistically, he's only average on the greens, at 89th in strokes gained putting. I think Tiger has the guile to put himself on the fringe of contention, but to really threaten he has to have his best week of the year on the greens and off the tee. That's a very big ask. Many players would indeed be distracted but Phil is such a cheeseball I think he actually enjoys it. For Tiger: "Was it worth it?"